Thanks for taking a look at our stamp club site. We hope through this site to inform you about our club and interest you in paying us a visit. We will introduce you to our activities and highlight the important and interesting areas about our club. We welcome your comments and suggestions to make this site interesting and informative. There are thousands of organizations, each with a specific purpose or goal. There are so many reasons why one should consider becoming part of an organization he or she believes in. 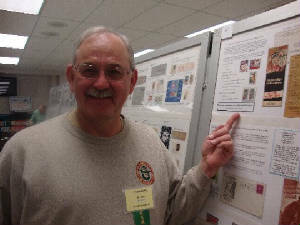 By being a part of the Hagerstown Stamp Club you will meet people of all ages interested in the same things that you are. Stamp collectors share their knowledge, wisdom, interests, and friendship with not only collectors, but with people in general. In developing this web site, we hope to get our message out to a larger audience of people interested in similar issues. Stamp collecting is more than just saving little pieces of paper or covers (envelopes). To some people this one of the main focuses of collecting. To others, first day covers, postal history, cancels, or postmarks are their forte. Still to others, history of the stamp issuing country they collect, paper or perforations, etc. is the main interest. I think for many however, they simply enjoy the little works of art, history they glean from the stamp subject depicted, and meeting others who share a similar interest. Collecting stamps offer a pleasant way to spend time surrounded by a quiet hobby the whole family can and do enjoy. Please get in touch to offer comments and join our mailing list. Just click on the link. See change of venue, below, for this show only!!! Club members enjoy the benefits of membership with a variety of stamp programs, discussions, auctions, and more. We invite you to visit. Our members are more than happy to answer any questions you may have. You to can be part of the fun. Why not come to a meeting and see what you are missing. Just ckick on meetings link for more information.